Overview : This section has been written to help you as a new or existing owner of a greyhound to feed your dog correctly. We have had many enquiries from people, many of whom have not adopted from us, asking for advice. It appears many of you are desperate for help. It is common for greyhound owners to encounter problems with their dog either refusing to eat, eating but dropping weight or eating well but with a continually "runny tummy". Feeding also is responsible for some behaviour problems like hyperactivity, destruction of property or exhaustion. Between all of us who work for Greyhounds for You we have over 100 years worth of experience with greyhounds, so we do know what we are talking about. Most of the problems encountered with feeding are caused by the owners ignoring what they've been told by us or thinking that their way is best because the pet shop or vet has recommended a certain type of food for their dog. Other common reasons are that people do not like the idea of raw feeding or having to prepare meals for their dog, as they would their family. You do not have to spend ages preparing food for your dog, there are time and labour saving alternatives. In the vast majority of cases complete food does not agree with greyhounds. Most complete foods have a high concentration of artificial colourings, flavourings and preservatives. An ex-racing greyhound has been raised from a puppy on additive free food and as such they do not tolerate additives at all well. There are also potentially many other side effects not already listed. Consider for a moment, the effect that food additives and colourings can have on some children. Children can suffer from hyperactivity, loss of concentration, destructive behaviour, upset tummies or in some cases allergic reactions. This type of problem is not unique to humans, dogs can and often do react in a similar manner. A BARF diet (Biologically Appropriate Raw Food) ie, a completely natural raw meat and vegetable diet. This is the type of diet that a dog in the wild would eat, they do not suffer problems with salmonella or e coli, which is most people's concern. A dog's digestive system can cope with raw meat easily, it is what they would eat if they had to catch their own dinner. Not only would they eat the meat they would eat the bones, intestines and fur/feathers too. If you do not want the bother of preparing fresh meat and vegetables for your dog on a daily basis you can buy the same diet as a frozen mince from most pet shops or from a company like Nature's Menu. Nature's Menu comes in a variety of pack sizes and different meats. A 30kg greyhound would need approximately 1kg of Nature's Menu a day in two separate feedings. Feeding amounts may vary with the individual dog. If your dog is losing weight, increase the amount fed and if he/she is getting too fat, either increase the level of exercise or reduce the quantity that you are feeding. A mixture of raw meat such as Nature's Menu minces or chunks mixed with some cooked pasta, rice and/or vegetables (greyhounds particularly enjoy vegetables like potatoes, carrots, cabbage, broccoli and cauliflower). When cooking rice, pasta or vegetables for your dog do not add salt. A 30kg dog on this type of diet should receive around 500g of meat and 500g (pre-cooked weight) of other ingredients daily. As above, vary the amount to suit your dog. If freezer space is a problem in your home, or the cost of feeding is an issue, there are other alternatives we have found that suit greyhounds. The cost of feeding using the above feeding regimes can add up, especially if you are feeding more than one greyhound. There are many "complete" dried foods on the market suitable for working dogs such as greyhounds. However, at G4U we are not advocates of this method of feeding. Although these biscuits are marketed as a complete food for working dogs/greyhounds, we do not recommend feeding greyhounds solely on this product or any other complete food. We have found through our own experience that they are best served with a raw meat mince (and some vegetables, if you have them available). Adding the meat and vegetables help to maintain a healthy body weight, muscle tone, coat condition and digestive system. We advise that some greyhounds prefer their biscuit lightly softened with hot water. Add the raw pet mince to dry or softened kibble. If you really cannot face feeding raw meat, we recommend Nature’s Menu pouches or Naturediet punnets. Both are holistic diets and the closest to feeding naturally without using raw meat. :: Never feed your dog human chocolate, even small quantities can be fatal to a dog, plain chocolate is especially dangerous. The higher the cocoa content, the more poisonous the chocolate. Cocoa shells which are sometimes laid on flower borders to prevent weeds growing are also potentially fatal to dogs if ingested. :: Do not feed your dog grapes, raisins or other dried fruit, all are poisonous to dogs and cause kidney failure. Extreme caution is required during the Christmas period as tree chocolates, mince pies and Christmas cake/pudding could be very tempting, but ultimately fatal to your dog. :: Do not feed your dog gravy that is designed for people (e.g. Oxo, Bisto etc). The salt content in these products is far too excessive for dogs to metabolise and if these products are fed too often our vet has confirmed that kidney failure could well be the result. :: Do not feed products containing Xylitol (an artificial sweetener) used in toothpaste, chewable vitamins and some "sugar free" products for diabetics. In dogs, unlike humans, this compound stimulates two and a half times the insuline release of ordinary glucose. Eating even a small amount can lead to seizure and liver failure. :: Alcohol, coffee (due to the caffeine content), onions (in any form), and avocado are all foods best not fed to your dog as these products too are potentially harmful to your dog's health. :: Many of the medicines we use for our own aches and pains are also potentially lethal to dogs. These products include pain killers (ibuprofen, paracetamol etc), cold relievers, anti cancer medications, anti depressants and vitamin tablets/liquids. Please always ensure that these types of product are stored in a dog-proof storage unit. If you suspect your dog has scavenged/ingested any of these products please contact your vet for immediate advice. :: We do not recommend the feeding of many of the proprietary dog treats available. Most are very high in artificial colourings and preservatives etc. They can give your dog an upset tummy and in many cause extreme flatulence. We recommend Nature's Menu Mini Treats (excellent to keep in your pocket for recall practice), dried tripe, pig's ears and raw chicken wings, raw poultry necks, raw lamb's necks or ox tail as treats. These are all good on the dog's stomach and also (with the exception of the treats) are excellent at helping to keep teeth clean. Small cubes of cheddar cheese can also be used safely with some dogs, although in others runny stools will be the result. :: We do not recommend the feeding of cow's milk. Milk is not well tolerated by dogs as it contains lactose and many dogs are lactose intolerant. They love the taste but it often creates very runny stools. It is therefore not good for the dog because his/her food is being forced through the body too quickly for the nutrients to be fully absorbed. It's also not nice for you, if you've ever tried to pick up a runny stool from a pavement, you will know exactly what we mean. :: We would not expect you to feed your dog these next items, but given access to them some dogs will consume them and they can be fatal. Bark chippings (used as weed repellents/ground cover in gardens or play areas) made from cocoa bark are extremely dangerous to dogs. If you are planning to use bark chippings in your garden please ensure you choose a brand that is not made from cocoa bark. Anti freeze is extremely appealing to dogs due to it's sweet taste, but it is highly toxic to them. Please do not allow your dog to drink from puddles in the street, it may contain traces of antifreeze. Many house and garden plants are also toxic to dogs, the list is so huge however that we recommend you do your own research to be aware of what your dog may have eaten in the event your dog shows signs of poisoning and needs veterinary attention. Unlike most other breeds of dog, as a greyhound ages there is a tendency to lose weight. It is not unusual for a very elderly greyhound to look like "a bag of bones". To minimise this aging effect, we recommend that you follow the feeding guidelines as above, but introduce more carbohydrate into the dog's diet. Carbohydrate is a "slow release" form of energy and it also helps considerably to keep weight on a dog. The best sources of carbohydrate for dogs are pasta, potato and bread! Add some of these ingredients to your elderly dog's diet and you will begin to minimise the weight loss so typical of this breed. 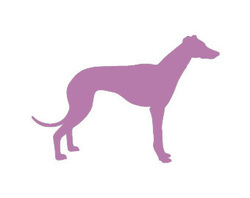 Feed as for an older greyhound (above) in larger quantities but split the amount fed over 3 to 4 meals a day until your dog reaches the correct weight. It is impossible to give you a general weight guide because greyhounds have a huge variation of body height and build. A greyhound is at the correct weight for a pet when you can just see a faint outline of the hind two ribs, no spinal or pin (hip) bones should be visible . If you can clearly see the pin (hip) bones, the vertibrae and all the ribs clearly protruding your dog is seriously underweight. If you can find out your dog's racing weight then that would be helpful. A pet greyhound should weight approximately 2kg more than he/she did as a racer. :: If the dog is refusing to eat at all or is vomiting back what is eaten, take your dog to the vet. :: If your dog is being fussy, because it's "holding out" for something better, ignore the behaviour. No dog will starve itself, when it's hungry it will eat. Remove the food, offer a fresh meal at the next feeding time. There may be an ingredient in the meal that your dog genuinely does not like the taste of. This is trial and error to find out what it is that the dog objects to. For example most greyhounds love carrots, but a few will eat around them and always leave every trace of them in the bowl. :: Sometimes, due to hot weather or just feeling a little "off colour" your dog will not eat sufficient to maintain weight. If there is no medical reason for not eating you may need to just tempt him/her with something particularly enjoyable to get him/her eating again. A tin of sardines, mackerel or pilchards in oil or tomato sauce mixed with the normal food should have the desired effect. Do not feed these products regularly though, as the salt content is far too high. :: There is a homeopathic remedy for appetite loss called Arsen Alb, which can be obtained from online homeopathy suppliers. This remedy has been useful with our own pet greyhounds who have had occasional bouts of appetite loss. Racing Greyhound Cortaflex is very good at alleviating the pain of arthritis or general joint stiffness. Available from HNC Neutraceuticals. You should notice a dramatic improvement to your dog's mobility and comfort between 1 and 4 weeks, dependent on what condition you are trying to alleviate. This product is especially beneficial to greyhounds that suffer with back problems/pain. Fragaria, a homeopathic remedy which when combined with the dog eating hard chews has the effect of removing tartar from your dog's teeth. When used for around 1 month in the correct dosage a dramatic improvement should be noticed in your greyhound's teeth. (Ainsworth's on our external links page supply Fragaria.) A beneficial side effect of Fragaria use, is the improvement in the smell of your dog's breath. Fragaria will not cure rotten teeth, it will only help to remove the tartar build up, you may still need to visit the vet for your dog to have a dental. Coconut oil is a beneficial supplement that will help to improve joint mobility, skin and coat condition. Brewer's yeast is a good all round supplement with the added benefit of deterring fleas and ticks. Evening Primrose Oil is very useful at curing the problem of dandruff. You can usually find a liquid form of it at farm shops/equine suppliers which is combined with cod liver oil. This product should be free of detrimental additives and is worth seeking out as the capsules of evening primrose oil designed for people often contain added vitamins. Over time these vitamins can be detrimental to the dog's wellbeing. Evening Primrose Oil should not be given to dogs suffering from any form of epilepsy as it may make the dog more likely to suffer from a seizure. Garlic can be added to your dog's food as this is a natural form of flea repellent. Tinned tomatoes and banana in moderation are a good aid to alleviating cramp. Both products contain potassium which can reduce or eliminate the cramp attacks. Canned sardines, mackerel or pilchards in oil or tomato sauce are suitable once a week for dogs and these help maintain joint mobility, skin and coat condition. They are also a useful appetite stimulant for dog's who appear "off" their food. Do not feed canned fish in brine, even drained the salt content is harmful. Arnica is useful for the short term treatment of stiffness or lameness. It can be bought in gel form for rubbing onto the sore area or in tablet form for ingestion. Green lipped sea mussel is another useful food additive which can help alleviate stiffness or lameness, it is not an instant cure however. You will need to feed it daily for several months before an improvement is noticed. Rhus Tox, a homeopathic remedy combined with the use of a magnetic collar can considerably alleviate the pain of arthritis and improve the dog's mobility and quality of life. The time that you feed your dog(s) is entirely your choice, feed to suit your routine. However, please bear in mind the following recommendations to help you decide the right time and manner for you and your dog. :: Do not feed your dog immediately after vigorous exercise for the same reason as above but also because your dog may be too tired/hot to eat and will likely waste food. :: Always ensure that your dog has access to fresh water. Check bowl levels regularly, particularly in hot weather. However, a dog should not be allowed to drink excessively for 1 hour before or after meals. :: Try to allow at least 5 hours to elapse between the dog 's last meal and his/her last toilet trip. In this time food should have passed through the system sufficiently to save you an early hours "alarm call" for toilet purposes. :: You may want to consider using a feeding stand to raise your dog's bowl height. Again, this helps prevent incidence of stomach torsion. A raised bowl is very beneficial to a particularly tall or elderly dog or one who suffers from any joint stiffness. The need to drop their neck and shoulders to eat is eliminated and so too is the difficulty of eating with, in effect, their head below their body . Try it yourself and you will find that it is not easy or comfortable. You can purchase feeding stands from most good pet stores (usual cost around £30 for one that holds a water bowl too) or you could easily make one yourself from an old coffee table or upturned bucket etc. All that needs to be done is to cut a bowl sized hole into the table/bucket. If you feed your dog indoors a feeding stand is probably preferable as the other alternatives can look rather unsightly. :: After eating give your dog a chance to toilet. Most dogs will at least urinate straight after feeding and they will appreciate the opportunity. :: If you want a polite, well mannered animal around food, never let your dog beg food and never respond to those begging eyes. Your dog will wait happily for you to finish your meal if you are consistent in this (a newly homed dog could take some time before this stage is reached). You can of course give your dog the left overs once you have all finished eating, but not if you are a salt fan and have added copious amounts to your chips! :: Bloat is life-threatening. Spotting it early and getting immediate veterinary treatment are the key to your dog surviving. We believe the mortality rate for bloat is almost 50%. :: Large breed dogs with deep chests are the most commonly affected by this condition. :: Acting early is crucial to the survival of your pet. If you see the following signs in your dog, we recommend you get your dog to a vet immediately. If you are at all unsure about your pet's behaviour after eating, we recommend you contact a vet straight away for their advice . Disclaimer :: please remember that the advice given here are suggestions only. If you have any concerns about the well-being of your greyhound please always consult a vet in the first instance.